I didn't plan to post this work here, but today I received few negative criticism from non-artists (and 2 pixel artists) in my public. So I decided to show the animation here. Do you think that something is wrong with a mermaid's animation? In truth, I don't have much time to bring the picture to perfection. Although I'm going to clean the dirty pixels later and will fix her ritht shoulder (it leans too far during the movement). So I brought it to the level "now it looks OK", but not to level "now it looks perfect". ...and in conjunction with other details it's too unlikely that anyone will notice anything about mermaid's animation. What do you think? Am I right or better to fix some details? I think it looks great but its style clashes with the tiles and the other character's style. Agreed about the style clash. Her arm and body become shorter by a pixel for some of the frames, it looks off. It's the sort of idle animation you'd see in an 8-bit RPG with tiny sprites, it feels out of place with a more realistic style. The arm also seems to get a pixel thinner in one of the frames. I think it would look better to keep the body animation sub-pixel and subtle unless you have a particular movement for her to do. I guess you were aiming a breathing animation, but now she is breathing very heavily. As she looks like some kind of mermaid or naga, I would suggest a horizontal sway instead of the vertical bounce for an idle animation. Guess you mean problem with perspective, but not the problem with style. I think both characters and tiles are in one style, so if we remove the armor from the succubus, then there will be the same body as that of a mermaid. But yes, there is a problem with mermaid's perspective, I agree with this. I see, I will try to fix it. And yes, that was what I was guided by - old zelda-like games and other old 8-16 bit games. 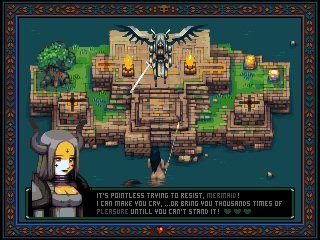 I think this is quite acceptable for a game that looks like a game from 16-bit console. Many Zelda-like games continued to use such idle animation on 16-bit and more bit consoles. It's something like a nostalgic tradition, so it seems to me that such an approach is quite appropriate. Ok, thanks for feedback, I will try to fix it such way. And you're right, for such a creature swinging in the horisontal direction is also appropriate. General problem for me that the sprite is too small, therefore shoulder/chest swinging is too intense while she breathing. I know that people on Pixelation like to advice example from "Chrono Trigger" in such cases, but I still don't understand how to use this. So now I have a good reason to try it again. When I mentioned the style clash, I was primarily referring to the style difference between the portrait in the text box, not the other sprite - those two match well enough. In addition, the environment seems to be at a smaller scale and more cartoony than the characters. I understand about the inspiration, but I don't think it comes across in this style, and just looks like a mismatch. Consider building on the implied motion of those sprites, interpreting it to match the more rendered, detailed look of your sprites. Incidentally, since you have the luxury of hiding the mermaid's lower body, you can create that bobbing motion by having her bob in the water rather than from her waist. The artists of old would've probably gone for that, given the opportunity. When I mentioned the style clash, I was primarily referring to the style difference between the portrait in the text box, not the other sprite - those two match well enough. Ok, maybe it's style clash to some extent. If we look at portraits and sprites in games, then this kind of difference is quite common. So, I don't see any problem in this, I just like it, both portrait and sprite. I don't feel discomfort from a small stylistic difference. Honestly at first I wanted to make an portrait based on the enlarged head and bust of the succubus sprite. This probably would make the portrait look more like a sprite. But then I decided that the sprite's head looks too sinister, so I drew the portrait from scratch. In addition, the environment seems to be at a smaller scale and more cartoony than the characters. This is due to the plot - both characters are giants and much bigger than ordinary people. Bobbing motion is good idea, thanks! I'll try it as the horisontal movement suggested by Adam. Everything else looks more outlined and with more contrasting colors than the mermaid. Her shading is way softer and realistic than the other character and the tiles imo. The weird thing about the portrait is that it looks more cartoony than the sprites and it's usually the opposite? Not a big problem for me anyways. I still don't see any mismatch in this. For me it all looks quite organic. The weird thing about the portrait is that it looks more cartoony than the sprites and it's usually the opposite? I don't know what to say. I just like this combination, and don't see anything weird about it. In any case, my question was not about the picture as a whole, but about the animation of a mermaid. But thank you for feedback, maybe when I look at picture with fresh eyes I will see weird things. Or maybe not.